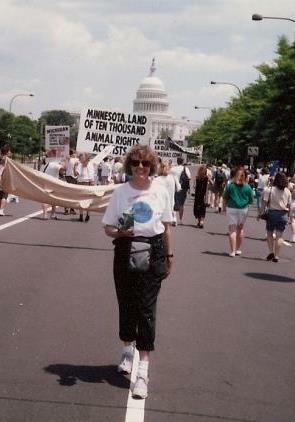 Vonnie at the 1990 March for Animals in Washington, D.C.
We’re sad to report that Animal Rights Coalition Founder Vonnie Thomasberg passed away on July 13. Vonnie founded ARC in 1980 and for over 30 years defended the rights of nonhuman animals and provided leadership and inspiration. To learn more about this exceptional woman and her fascinating life, read Vonnie’s article “Look How Far We’ve Come!” in the Winter 2011 30th Anniversary issue of ARC News and “History of an Activist.” Both articles are guaranteed to give you an appreciation for Vonnie’s groundwork that went into making ARC the strong activist organization it is today. Growth. Possibility. Inspiration. These are the words that most aptly describe ARC’s journey in 2013. 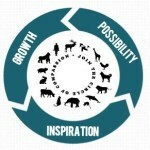 As the oldest grass-roots animal rights group in the country, we’ve seen our cultural relationship to our treatment of animals shift and go through many stages and we’ve been there, helping to shape and move this process forward. Please check out our colorful Annual Report to see how 2013 was an outstanding year in terms of reaching a record number of people with the message that animals matter for their own reasons. A recent study by the Humane Research Council looked at several pieces of literature from large animal advocacy groups and discovered that they were all written at a literacy rate of 11th grade or higher. But according to the U.S. Department of Education, only about 15% of the population reads at that level. 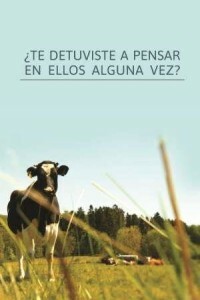 So ARC set out to create a brochure at the 7th grade reading level that made the case for animal equality in simple terms so more people could receive our message in a way that works for them. We’re excited to announce that the brochure is now available for download in Spanish and French versions, with more versions in the works. Thanks so much to all of our amazing volunteers and the 100+ guests who came and ate amazing vegan waffles and toppings at the Fifth Annual Global Vegan Waffle Party on Saturday, May 24 at Fuller Park in Minneapolis. Special thanks to Matt Mehlhoff for taking great photos of the event. This wasn’t just any waffle party. 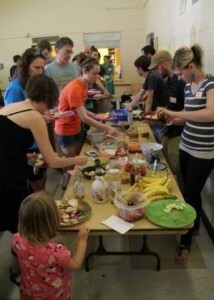 This was a VEGAN waffle party. Again this year, this event allowed us to begin many new conversations about where our food comes from and the effects of our food choices.Showing people that eating vegan food can be easy and delicious helps remove barriers that folks may otherwise have about going vegan. If what helps people consider that step is showing them that a vegan future can still have amazing brunches in it, we’re happy to help. ARC’s new Volunteer Coordinator maintains a strong relationship with volunteers through regular communication and helps new volunteers get involved in a way that works for them. Ashley is a passionate activist and vegan with a long history in animal rescue and a background in graphic design. If you’d like to learn about volunteering with ARC, Ashley will be happy to help you discover how you can best use your talents to help animals. And we’d like to send a shout out to Jenna Cameron, our former Volunteer Coordinator. We were sad to see Jenna go and will miss her, but we’re excited for her new position at Hampton Creek Foods in San Francisco where she’ll be working to get affordable, great tasting vegan foods into mainstream grocers and food service industries. We wish her the best and Hampton Creek is lucky to have her. 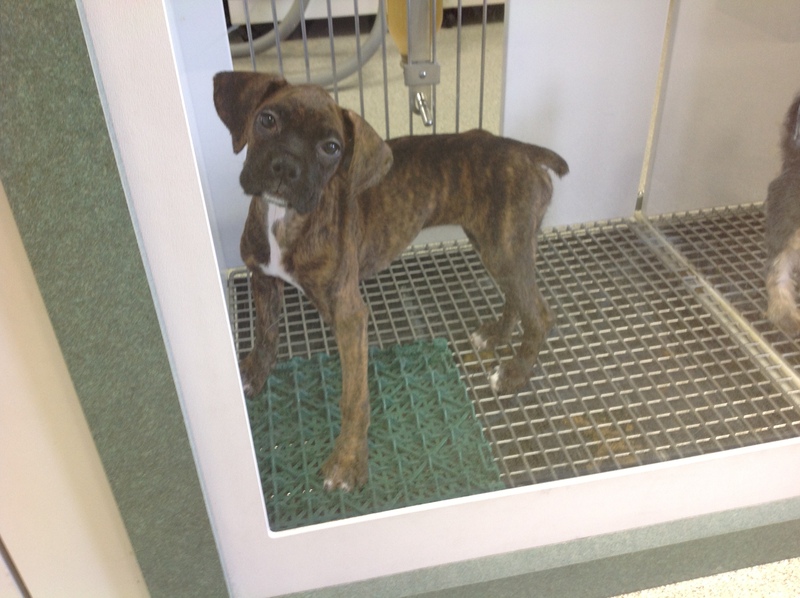 Petland is a chain of retail stores that sells live animals. These animals are sourced from breeders and/or brokers, where they may be subject to abuse and neglect. The Animal Rights Coalition’s Minnesotans Exposing Petland campaign demonstrates outside Petland stores to educate the public about Petland’s selling of animals for profit. We staunchly oppose animal mills and breeding operations, no matter the scale, and advocate adoption and rescue as humane alternatives. Selling animals for profit perpetuates the belief that animals are commodities with price tags. Minnesotans Exposing Petland’s goal is to persuade Petland to change their business model of selling live animals. Petland Canada has already adopted this measure, and we are asking Petland USA to follow suit; stores would stay in business and employees would keep their jobs, without the need to sell animals and make a dollar on an animal’s life – a win/win solution for all. With the Shakopee Petland outlet closed down, the only remaining Petland store in Minnesota is in St. Paul. Minnesotans Exposing Petland will continue to hold demonstrations and work to educate the public about Petland and urge the company to change the way it conducts its business. We are always looking for more volunteers to engage in conversations with the public, and demonstrations are an easy, positive way to get involved in this important issue. 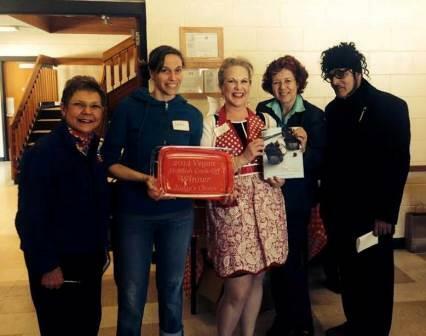 Many thanks to Betsy Born for all of her help organizing the “6th Annual World Wide Vegan Bake Sale – Twin Cities’ Style” and to everyone who baked and shopped on Saturday, April 26 at Ethique Nouveau. 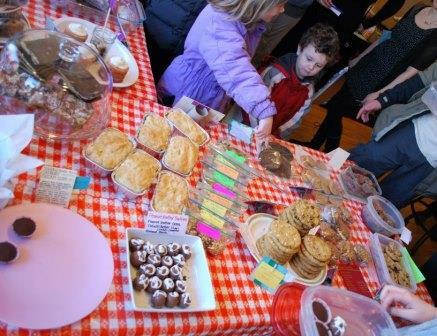 We were overflowing with sweets and savories, and we even had treats for dogs this year. We’re so lucky to have incredible volunteers and supporters! All proceeds from the sale were donated to benefit the programs of the Animal Rights Coalition to help animals. 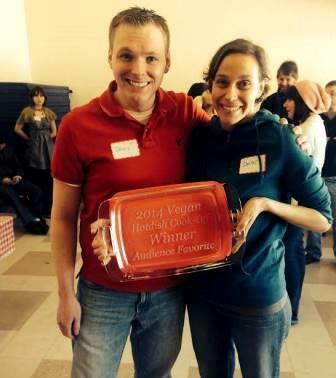 Thanks to everyone who came out to the second annual Twin Cities Vegan Hotdish Cook-Off. Over 100 people thoroughly enjoyed themselves, the food was delicious, and we were thrilled to see all the new faces, many of whom commented that they saw the story about the cook-off in the StarTribune and came because they wanted to learn more about being vegan. Check out recipes from the competition. 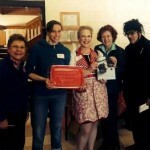 Thanks to our judges: cookbook author Robin Asbell; Susanne Mattison, regular food judge at the State Fair; and Scott Seekins, famous in Minnesota for being famous. Congratulations to Mary Johnson Strand, Judges Choice winner for her Chick’n in a Biscuit, and Troy Wuollet, Audience Favorite winner for his Pizza Hotdish. 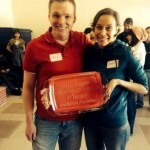 Each winner received a custom glass casserole with their winning title etched into the glass. All the competitors brought serious game to the dining table: Delicia Mattox, Katie LaRoche, Barbara Stasz, Megan Kosse, Melissa Peers, Melissa Peck, Rebekah Rising, Teresa Goodall Barrett, Laura Ford, and Christina Roberts.